Many people are not familiar with regulation, so I am including a short explanation here. First, consider that the piano consists of more than 1500 parts, many of them constantly moving. It is logical then, that some of these parts may go out of alignment, or need to be adjusted because of compacting felt and so on. Think of a a piano action like the works of a clock with rotating gears that have to be aligned just right, or else it will get stuck and possibly even break. 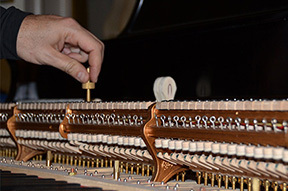 The repetition mechanism of all pianos, whether a grand or vertical, is regulated by a part known as a jack. The jack must escape from under the hammer assembly when a key is played, and return when the key is released, in order to push the hammer toward the string when the key is played again. Of course there are many parts to this, and each key on a piano has these parts, but I think my eplanation will aid your understanding as much as needed. 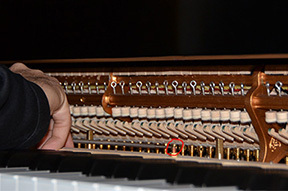 When string grooves on hammers get too deep, it has a negative effect on the tone piano, but that can easily be remedied by filing (reshaping) the hammers. Since the outer layer of the hammer is removed, so is some of the laquer that was used in the original voicing of the instrument. This is remedied by doing another voicing. If the hammers are reshaped, the geometry of the action changes, and the piano will need to be regulated to compensate for that. When I regulate a piano, the service includes cleaning the action parts, but not the soundboard, althoug that is done as needed. I have found found that on grand pianos, a string cover, such as the Barnes String Cover listed below helps to significantly reduce the negative effects of dust on the piano. The air inside most homes is very dry during winter months because heat tends to dry out the air. The ideal humidity level for a piano is 42%, and anything below 35% or above 55% will have a negative impact on your piano. You may notice sluggish keys or other problems. If you like keeping windows open during mild the months of the Spring or Fall seasons, it can really take a toll on tuning stability, not to mention, corrosion on the strings, and the effect on felt parts In fact, I would not at all recommend opening a window in the room where the piano resides, unless the humidity level outside is below 60 percent. The Dampp Chaser® Piano Life Saver® system has been proven to be most effective for both upright and grand pianos and provides a stable environment inside you piano throughout the year. Another product that I can recommend is a piano string cover by Barnes String Covers. This cover is only for grand pianos and helps protect your piano from the harmful dust. Dust not only sticks to the soundboard, but it also adheres to the strings, contributing to corrosion and also gets into action parts.